An exhibition exploring the work and enduring legacy of fashion designer Christian Dior opens on Saturday at London's V&A museum. 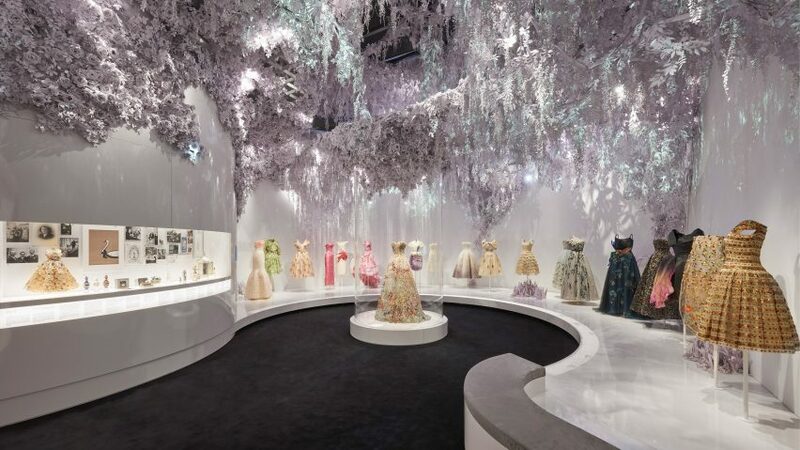 Dior: Designer of Dreams showcases over 500 objects, with 200 haute-couture garments exhibited alongside accessories, fashion photography, perfume, original makeup, illustrations, and magazines. It will also include a selection of Christian Dior's personal possessions. Divided into 11 sections, the exhibition – overseen by the V&A's curator of modern textiles and fashion Oriole Cullen – traces the history and impact of Christian Dior and the six artistic directors who succeeded him. It moves from the designer's early life to his Belle Epoque-inspired couture gowns, as well as showcasing pieces worn by Princess Margaret, ballet dancer Margot Fonteyn and actress Jennifer Lawrence. "In 1947, Christian Dior changed the face of fashion with his New Look, which redefined the female silhouette and reinvigorated the post-war Parisian fashion industry," said Cullen. "The influence of Christian Dior's design was all-pervasive and helped to define an era. In their own individual ways, each of the house's successive artistic directors has referenced and reinterpreted Dior's own designs and continued the legacy of the founder ensuring that the house of Christian Dior is at the forefront of fashion today," she continued. Based on a major exhibition Christian Dior: Couturier du Reve at the Musee des Arts Decoratifs in Paris, Cullen reimagined the show for the V&A to include an additional section on the designer's affinity to London – the location of his first fashion show at the Savoy Hotel in 1950. "Dior admired the grandeur of the great houses and gardens of Britain, as well as British-designed ocean liners, including Queen Mary," she explained. The exhibition, which is the museum's biggest fashion exhibition since Alexander McQueen: Savage Beauty in 2015, is arranged thematically, with areas focused on different aspects of the fashion house, including a room exploring Christian Dior's fascination with gardens and another looking at the brand's atelier. Each room features installations by Paris-based interiors studio Agence NC made to reflect each individual theme. One room, The Dior Line, looks at the brand's inaugural years through ten key looks designed between 1947 and 1957. The garments are displayed individually in mirrored boxes that are lined with borders of LED lights. Another room, Dior in Britain, is reimagined to resemble Oxfordshire stately home Blenheim Palace – the location of Dior's infamous 1954 charity show, attended by Princess Margaret and the then-Duchess of Marlborough. The garments are presented on mannequins in a double-layer glass cabinet. A special cylindrical cabinet at the centre of the room showcases the dress Christian Dior designed for Princess Margaret on her 21st birthday. Also in the room are gloves by leather accessories manufacturer Dents, knitwear brand Lyle & Scott and jewellers Mitchel Maer – all brands that Dior collaborated with regularly. A section titled The Garden references Christian Dior's love of gardens and flowers. Garments with floral embroidering and silk flower decorations are displayed in a glass cabinet that curves around the entire room. The ceiling of the room is covered in paper and cardboard decorations made to resemble roses and hanging plants. A highlight of the exhibition is The Ballroom, which showcases 70 years of formal evening wear against a lavish backdrop of glittery silver walls, wall-spanning mirrors and crystal chandeliers. Dior: Designer of Dreams is on show at the V&A Museum between 2 February and 14 July 2019.